Gareth Huw Davies - BrightCharger: the way to "intelligently" power your phone? BrightCharger: the way to “intelligently” power your phone? Energy-saving BrightCharger automatically gives phones just the right amount of power. I remember the question, in the distant technological past, in a Carphone Warehouse outlet on the Marylebone Road in London. I was picking up my first, clunky mobile phone. “And is it possible to overcharge the phone?” asked a customer alongside me. The assistant gave him some unscientific reassurance. No, he wasn’t to worry. And that answer has lodged in my mind as a comforting “fact” about mobile phones ever since. I’ve never bothered to check it, despite having recharged my phones and other electronic devices many thousands of times since that day. Today, 20 years on, I discover that, according to the makers of BrightCharger, a new “smart” charger for mobile phones and other devices, you can, indeed, overcharge your phone. This device promises to prevent you from doing that. It appears that a 90% charge is sufficient. The charge level decreases more rapidly when higher than 90% or lower than 10%, says BrightCharger. “As smartphone users may have noticed, charge levels may decrease by up to 5% within minutes of unplugging a fully-charged phone from a charger,” the company notes on its website. Yes, I’ve noticed that, but never wondered why it happened, or what it is doing to my electricity bill. The Finnish company behind BrightCharger, which launched in 2015, claims that continually topping up a device’s battery can pose a fire risk, and harm the lifespan of batteries, in exchange for minimal boost in charge. And energy is wasted, too, when chargers are “live” – plugged into an outlet, but not attached to a phone. BrightCharger is a straightforward and simple device that only does three things. Plug in your phone, or any device that uses a USB charger, and touch the light to begin charging. 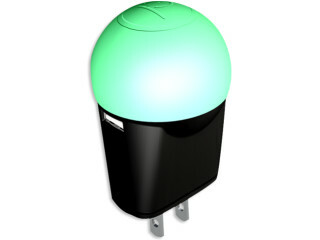 The LED turns green to show that it is delivering your device a charge. When it’s reached the optimum level of charge, it switches off and the light turns white. And that’s it. So if, for example, you are charging your phone overnight, there is no risk of overcharging it. When a charger is plugged in and consuming electricity, when there is a potential, though very small, fire hazard. When a charger keeps supplying power to a full battery. Here too it consumes electricity, harms the battery and poses a potential fire hazard. It doesn’t try to estimate how much energy is used on the estimated 10 billion devices (2017 figures) currently in use in the world, but there is clearly a lot of power wastage. “We think that saving even a single watt of electricity is good for both the wallet and the environment.” BrightCharger claims the lifespan of batteries will be longer, but I could find no technical support for this online or in the release I read. When it is not charging, BrightCharger can be used as an LED nightlight, using, so the company claims, “very close to zero” power. And nightlight mode can be disabled. The company launched a crowdfunding campaign on Indiegogo this month (May, 2017), and investors in this “socially responsible” product are able to please early orders. In September mass production begins. In October the first BrightChargers will be shipped to backers. This clearly isn’t a business operating out of the Helsinki garage. “The original idea came from my personal frustration with the overcharging issues of current chargers,” BrightCharger CTO and inventor Harri Tiainen says in a release. The market will decide soon enough, but at first glance (online) it looks like an interesting prospect, with you and everybody you know as potential users.